With all the exams, presentations and assignments this week, it would have been nice to have had a quiet day in the Teaching Brewery bottling or cleaning kegs. Instead, today was my special assignment day where I got marked as I brewed up my very own beer. And how did I luck into having my special brew day right smack in the middle of mid-term week? Yep. Volunteered for it. Didn’t think, “Hey, the week before Reading Week is usually full of exams and assignments.” I simply put my name on the available date, and there it was. 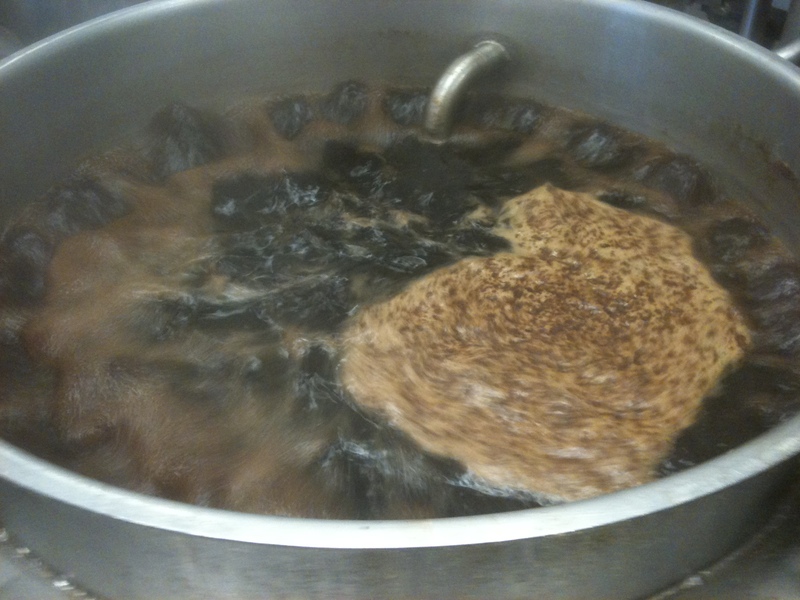 For you brewers out there, my recipe was for 60 litres of a black IPA (or as the chattering classes say, a “Cascadian dark ale”): 17.5 kilo grain bill, mainly pale ale malt, with 1.6 kg of Crystal 20, 800 g of Midnight Wheat and 400 g of Chocolate Malt. Hopping was 75 IBU worth of Amarillo. That much grain in a relatively small system resulted in a ridiculously long sparge–almost two hours. But the result was as black as the devil’s heart, and as bitter as a jilted girlfriend. But plans for world dominance must perforce await–more mid-term exams and presentations tomorrow. This entry was posted on February 22, 2013 at 9:02 am and is filed under Brewmaster. You can subscribe via RSS 2.0 feed to this post's comments.